Wouldn't it be nice for settled planets to have procedurally generated cities on them for some additional eye candy? From what I've been able to follow, Josh already has some experience in generating procedural cities/city blocks, so it doesn't seem like it would take too much additional effort. Also, given that location and ship names will also obey procedurally generated phonetic rules for each faction, it would be a cool addition were each faction to have its own procedurally generated architectural styling as well. Of course, maybe this is something Josh already intends to do, and I missed a post or two somewhere, and am currently being redundant. I think this would only be looked at if planetary transitions were incorporated, but I believe it has already been discussed that planetary transitions won't be included. The reason being, that you can't really see cities from space (just like you can't see the great wall of china from space, despite popular belief). However, maybe some sort of generated light map that represents population density, much like the pictures of Earth at night from space where places like the eastern coast of the US is lit up, but places like the Sahara are barren. DWMagus wrote: I think this would only be looked at if planetary transitions were incorporated, but I believe it has already been discussed that planetary transitions won't be included. The reason being, that you can't really see cities from space (just like you can't see the great wall of china from space, despite popular belief). I wouldn't say this necessiates seamless landings -- what I had in mind was more akin to how Freelancer does planet landings, which after a docking animation basically ends up at a "city screen" that includes links to merchants, the bar, etc. So I'm suggesting that this singular (or explorable in a very limited sense) screen be a procedurally generated scene with a unique architectural style for each faction in the game world. You're talking about the background scene behind the planetary interaction menus, right? Where you are on the planet and you have the buy/sell/whatever menus that you can pick through and do stuff with people on the planet? (I forget which video that is in, or I'd give a video/timestamp reference). Kayse wrote: You're talking about the background scene behind the planetary interaction menus, right? Where you are on the planet and you have the buy/sell/whatever menus that you can pick through and do stuff with people on the planet? (I forget which video that is in, or I'd give a video/timestamp reference). Yeah, that is correct. I believe you're referring to the pitch video. Yes, procedural cities are confirmed for such cases Granted, they're really just eye-candy to look at while you trade/chat/whatever, since you can't actually get out of your ship and interact with them, but it should still provide a nice backdrop to make planets feel more real. As for different styles of procedural architecture...probably not this time! Since planet side was in one of the dev videos I'm assuming that to some extent it is possible. If so, I would be more than willing to pay in the future for a DLC/Expansion to add gameplay to planets, especially along the lines of actually generating and moving around them freely. I'm going to bring this post back from the grave because the new update had me thinking about city lights like those pictures of Earth at night. The planet's in LT are nice to look at on the sunny side but on the dark side they *are* kind of dull. Wouldn't it be cool to have sprawling city lights below which you could see from space? I imagine if they're just a procedural texture layered on top of the planet it can't be too CPU intensive to implement. InfelixTurnus wrote: I'm going to bring this post back from the grave because the new update had me thinking about city lights like those pictures of Earth at night. The planet's in LT are nice to look at on the sunny side but on the dark side they *are* kind of dull. Wouldn't it be cool to have sprawling city lights below which you could see from space? I imagine if they're just a procedural texture layered on top of the planet it can't be too CPU intensive to implement. so maybe there are some helpfull ideas in there somewhere. I can only agree with what is being discussed here. I missed this thread when it was originally created but I'm all for making planets feel real. I use it on my laptop, it's such a good screensaver. 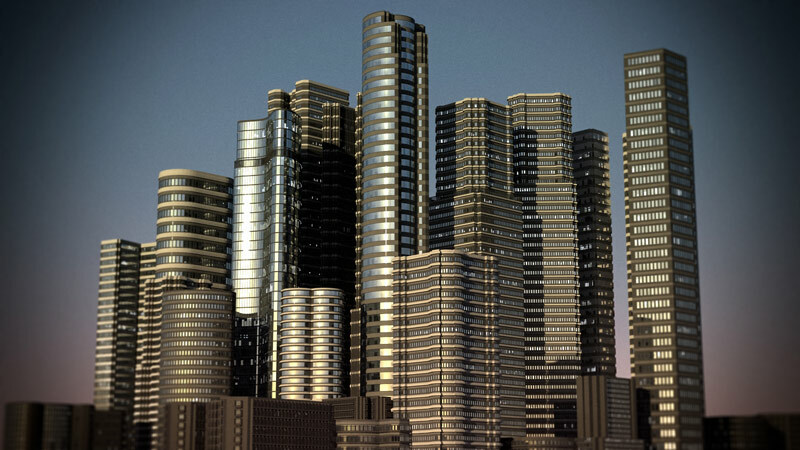 I can offer my own old (very old) procedural VRML (who remembers this old standard) city here. Well... Not bad for that time , it really needed a top end computer.